40 kind and clever tales with original artwork and background music that provide families with a traditional reading experience for all iOS devices. 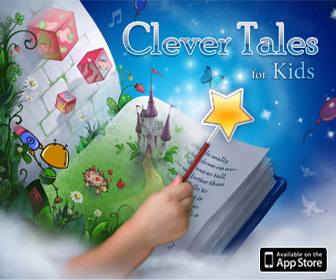 Along with exclusive content “Clever Tales” app has a variety of unique features. “Clever Tales” is a family reading app that helps parents start important conversations with their children, and discuss values and experience. There are 40 heart warming tales in 2 collections – for the little ones (4+) and for older children (7+). All the tales have charming illustrations with a soft color palette that brings the characters to life while evoking a child’s warm, imaginary view of home and the world. The exclusive children friendly jazz music was composed specially for this app. Writers of these tales, artists, app-developers and the music composer are people of different nationalities, ages and professions. They come from different countries: Russia, Israel, Holland, Colombia, United States, Germany, Lithuania, Ukraine and others. helps people learn great lessons for everyday life via engaging and entertaining form. These kinds of tales have passed the test of time, and though our tales were written these days (available only in AppStore), they have that old-fashioned charming style of storytelling that is so rare nowadays. In our tales you will ?nd wonderful characters: animals and butter?ies, kind magicians and robots, colors and music, beautiful princesses and kings, cars and kids. And what is very important these tales are about friendship and kindness, love and care, self esteem and society, mutual assistance and the never-ending miracles that DO exist in the world around us.